Description: KCS 4015 SD70ACE leads an eastbound NS train. Description: KCS 4015 on NS 336 pauses at Columbus Yard. TFM SD70MAC 1630 was trailing. Description: A southbound 124 car AEPX train rolls across Butler Creek, past the gate to this pasture as it revs up for the climb to Gravette. 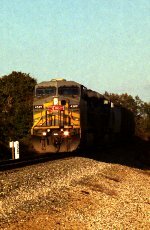 Description: A 77 car grain train rolls out of the shadows and into the light, the sun illuminating the nose of its KCSM leader as it rolls over the top of the small grade south of Decatur. Description: A southbound 77 car grain train rolls past the Cobb Vantress mill just north of Siloam Springs. Description: Several steer watch as a southbound grain train rolls past their grazing land north of Westville. Bet theyre wishing they had some of that!! Description: The DPU of a NB loaded coal train. Description: KCS 4015 at the racks in Heavener. Description: SD70ACe at the fueling racks in Heavener.